With food allergies on the rise, there has been an influx of food alternatives to supermarket shelves. You can now pretty much find an alternative to any food you want. In the milk department alone, there are several alternatives to cow’s milk: nut milks (e.g., cashew, almond, etc. ), soy milk, rice milk, hemp milk, flax milk, pea milk, coconut milk, etc. But what if you try many of these and still have an issue? It could be that there was a cross contamination issue, or there is something else in there that is bothering you. Because there are many other additives in store-bought alternative milks, it could be any one of those. The best solution to this is to just make your own. The cheapest milk to make on your own by far, is homemade oat milk. While I don’t feel the need to drink milk regularly anymore, I do have some baking recipes that really benefit from the addition of milk because of its creamy texture. I know I can substitute with canned coconut milk, but I don’t always want a coconut flavor in my dishes. 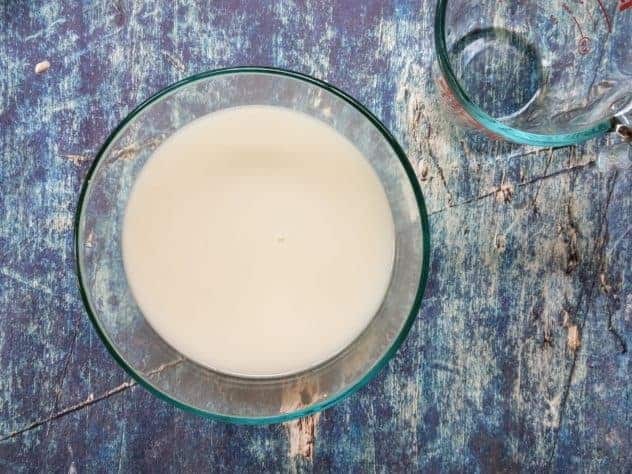 This homemade oat milk is really easy to make, comes together in less than 10 minutes, and it only has two ingredients. 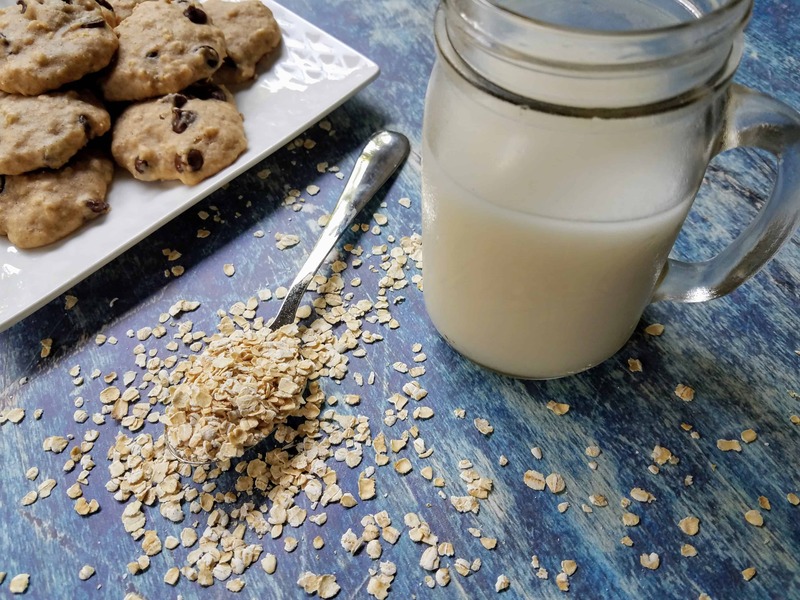 A bonus to making your own homemade oat milk, is that you can reuse the leftover oat milk pulp in chocolate chip oatmeal pulp cookies! It’s a win-win situation if you ask me :). Oat milk is simply a blend of oats and water. 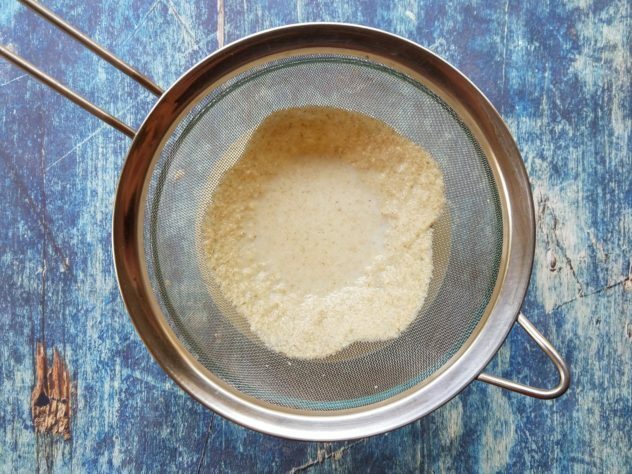 To make oat milk, all you have to do is blend oats and milk together in a blender and then strain the solids out. It’s very smooth and creamy, and works well in tea, coffee, cereal, etc. Yes, depending on your nutritional needs. It is a great alternative for those with a lactose intolerance, dairy allergy, and tree nut allergies. It also has a mild flavor profile, making it a great alternative for baked goods. Oat milk is also low in fat, cholesterol free, and it contains many vitamins and minerals. Unlike a lot of alternative milks out there, oat milk does have a decent amount of protein, although not as much as cow’s milk. Can you heat up oat milk? When heated, oat milk will become thick and take on a different texture. If you use it in baked goods, it won’t matter. However, if it is going to play a primary role in your recipe like in a sauce, I would recommend heating it up in the microwave a little bit and see if you mind the texture. The answer really depends on your nutritional needs. 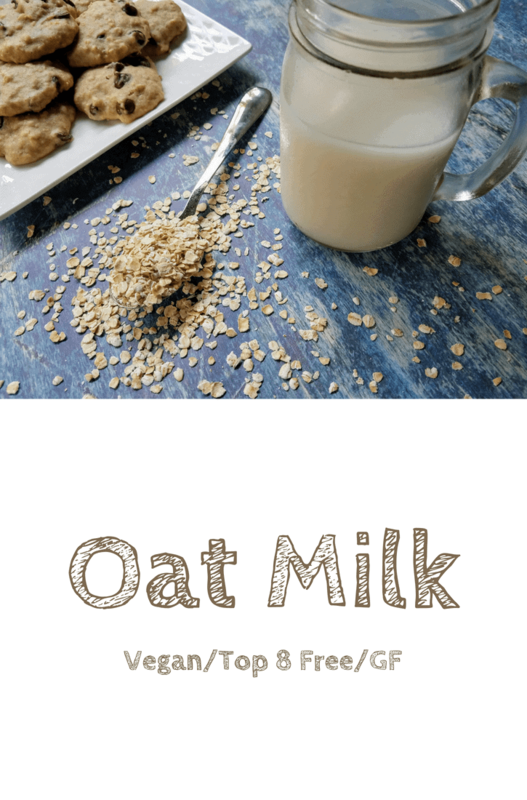 However, oat milk is a great alternative to cow’s milk because of its high nutritional content (sometimes beating out cow’s milk) and it’s allergy friendly. Oat milk tastes like oats. It has a very mild flavor, and it’s a little bit sweeter than cow’s milk. It also has a creaminess and fullness to it that resembles cow’s milk. In terms of replacement milks, I would have to say that this is the closest to cow’s milk that you can get. 1. In a large glass bowl, cover the oats with a lot of water and let them soak for at least 20 minutes. 2. Pour through a sieve, discarding the liquid. Rinse the oats in the sieve very well. It’s actually best to rinse the oats in small batches until they no longer feel slimy. If you don’t rinse the oats well at this stage, your oat milk will end up feeling slimy. 3. Add the rinsed oats and water to a blender. 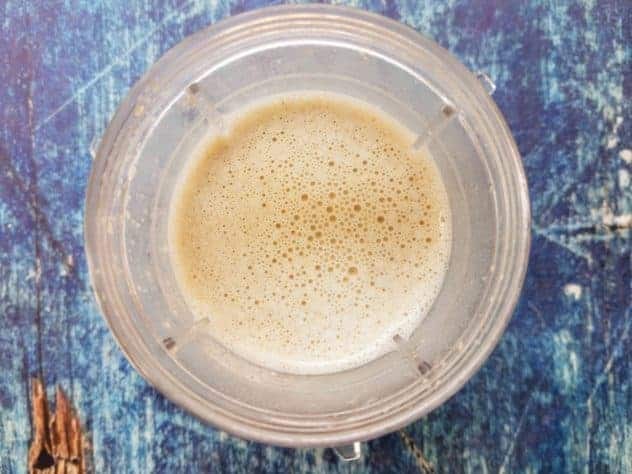 Blend until smooth and creamy (for me, this was 20 seconds using a magic bullet). 4. Next, it’s time to strain off the solids. 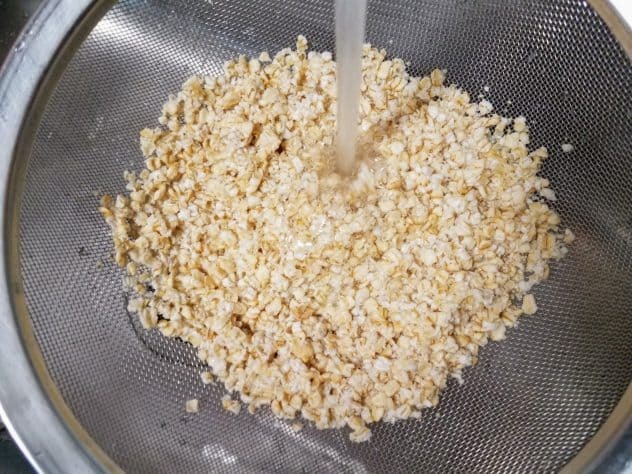 I like to strain my oat milk twice: once through a fine mesh sieve to get out the larger particles and once through a cheesecloth over the sieve to get out the smaller particles. 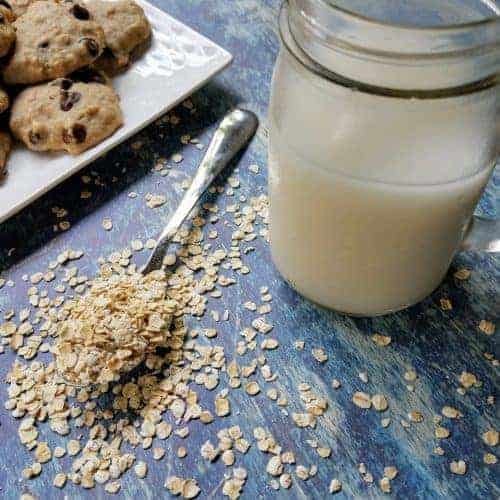 The solids that are left behind are referred to as oat pulp, and they can be used in a variety of things, including these awesome and delicious chocolate chip oatmeal pulp cookies (not going to lie…I am eating them right now as I write this post!). After straining, I like to add an additional 1 cup of water to thin the milk out. Depending on your taste preferences, you can use more or less. 5. The end result is a smooth and creamy homemade oat milk! The oat milk will keep in the refrigerator for 3-5 days. 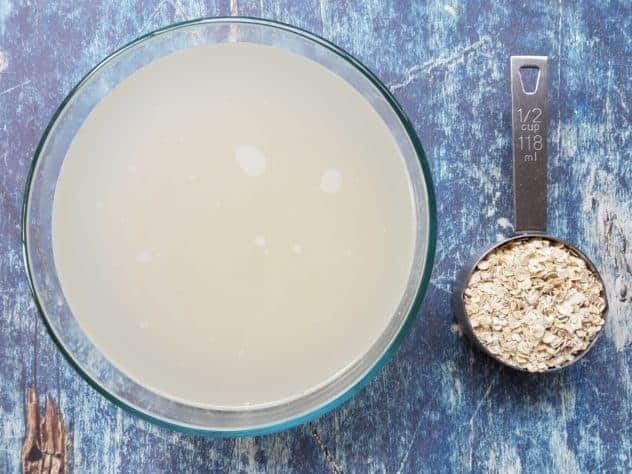 This homemade oat milk comes together in under 10 minutes! It's also a great alternative for those who need to avoid dairy and tree nuts, and for those who want to make milk as they need it! In a large glass bowl, cover the oats with a lot of water and let them soak for at least 20 minutes. Pour through a sieve, discarding the liquid. Rinse the oats in the sieve very well, until they no longer feel slimy. It's best to work in small batches. Add the rinsed oats and 3 cups of water to a blender. Blend until smooth and creamy (for me, this was 20 seconds using a magic bullet). Strain off the solids first using a fine mesh sieve, and then through a cheesecloth over the sieve. 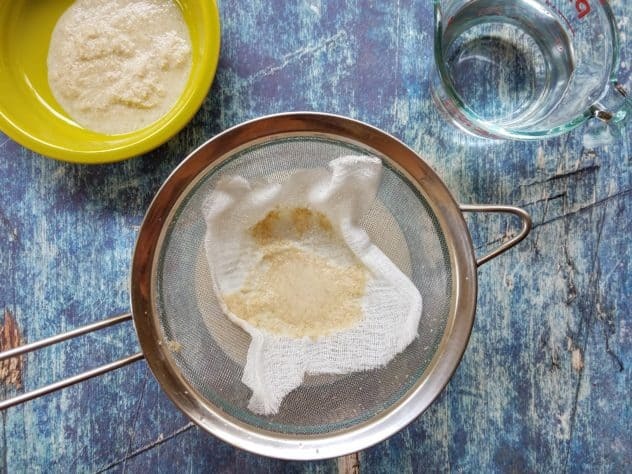 If there are still solids leftover, strain for a third time using a new cheesecloth over the sieve. Set aside the oat pulp to use in other recipes, or discard. At this stage, I like to add an additional 1 cup of water to thin the milk out. You can add more or less, depending on your taste preferences. If you want to flavor your oat milk, see the recipe notes for possible add-ins and their amounts. Add-in whatever flavors you want, blend again until everything is well mixed. Store oat milk in an airtight jar for 3-5 days. 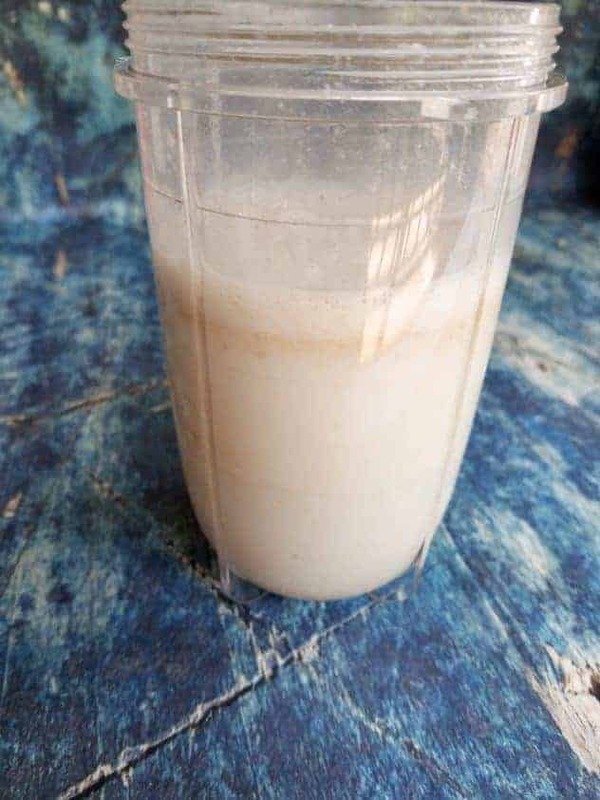 Shake well before drinking. Avoid using homemade oat milk in any hot beverages or soups. Heating oat milk causes it to become clumpy and gelatinous in texture. If you are going to use this oat milk in other recipes, I wouldn't add anything else to it. You can use up your leftover oat pulp in these chocolate chip oatmeal pulp cookies! Wow! I had No idea this was a thing! SUPER interesting, and for someone who is always watching her cholestrol, I really appreciate this milk source and recipe! Oatmeal with milk is a healthy breakfast option. I normally have oats with milk pretty much everyday for breakfast. It keeps you full till lunch and you dont have the urge to munch on junk. This is awesome! I didn’t know you could make it. We buy a milk in box with some ground oats and I like it. I just dunno if I can take it as it is. My boyfriend’s roommate always had a huge jug of oat milk in the refrigerator and in college, I thought it sounded like the most disgusting thing in the world. But this recipe sounds ABSOLUTELY delicious. I love the idea of using this in baking – the mildly thicker texture sounds perfect for that. I have to give this recipe a go ASAP. I use many of the milk alternatives such as soy, almond, cashew, and coconut. I have not heard of milk made from oats before. Once you prepare it and strain it looks like it is delicious. I’d love to try this. I don’t drink cow milk so buy natural but milks. However, I’ve gotta start making my own milk as I’ve got all the ingredients. I’ve never had oat milk so it’ll be something new to try. Wow, I’ve never heard of oat milk. I’ll definitely be trying this for my son, since he has such a tough time with dairy. It seems like it would be good with some spices added to it. Thanks for this great recipe. Although I often eat breakfast rats, I have not tried to make oat milk so far. 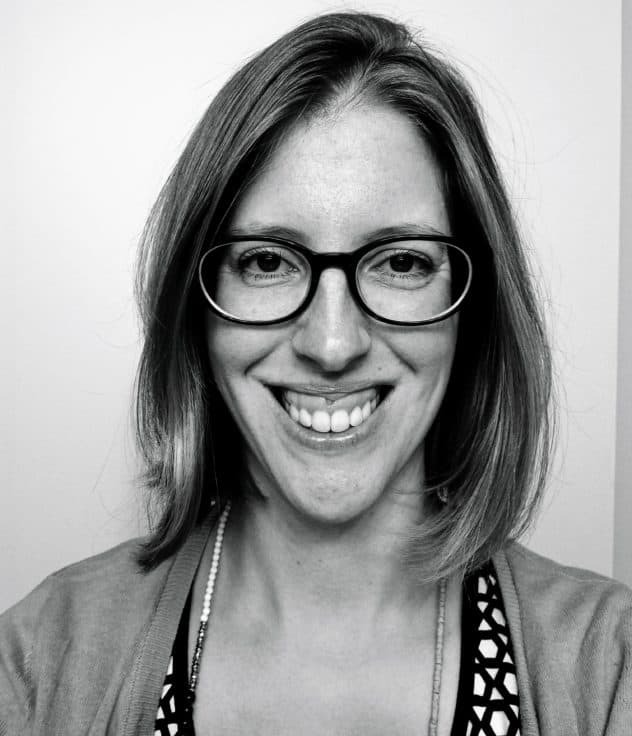 Hi Caitlin! No, you can’t use it to make any hot beverages unfortunately, or even put it in soups. As you discovered, heating up oat milk causes it to take on a different, and often undesired, texture. However, using it in baked goods is ok, because it’s not playing a ‘starring role’ like it is in a beverage. I mentioned this issue in the FAQ’s above. I will make this clearer though by adding it directly into the notes section of the recipe card.